Stunning imagery, prominent calls-to-action, and videos are surefire website attention-grabbers. But the words in between are what tie it all together. Writing for your website may seem like simply knowing your business inside and out, and filling your web pages with this knowledge. But writing that entices your visitors into doing business with you requires more forethought and an understanding of best practices. For website copy that speaks your customers’ language and maximizes visitor conversions, follow these guidelines. Of course your business is great, but your website is not the place to explain why. Instead, focus on your prospects. Tell them how they will benefit by engaging with your company. Most website visitors are looking for the ways your company can help them. How do they benefit by doing business with you? Make it obvious to them quickly and concisely and put it right up front to encourage them to stay and look around. Very few will be interested in drawn-out descriptions of your business. If your website copy isn’t leading your site visitors to the next level of engagement, then what is it doing? Create calls-to-action that entice visitors to act by giving them an opportunity to make a choice. Present a clear offer, and prospects will be drawn to make a decision on it. Check out that thought in the passive voice: Your brand will be brought to life by powerful creative services. Passive voice stunts conversion rates. It’s also wise to think ahead about the questions or protests a prospect might have when faced with your call-to-action. Consider all the possible objections to your proposal and write copy that satisfies them. 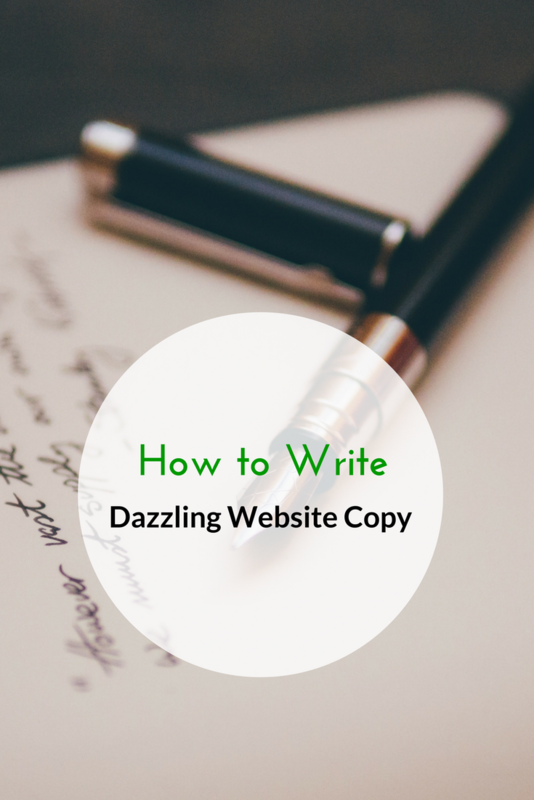 When you’ve written copy for one of the web pages on your website, read it over as if you were a site visitor. Is anything unclear? Do any potential objections go unanswered? Do this page by page as you go, rather than writing your whole website then editing it all at once. Editing your copy is about making it more persuasive and engaging. While you’ll be sure to catch grammatical mistakes and typos, you’ll also sharpen your eye for unnecessary words. Don’t leave a sentence at 30 words if they same thing can be said in 10. Use only essential words. Keep in mind, there will be sections of your website — perhaps your “about” page — that lend themselves to longer writing and allow you to say everything you want to say. But even these longer sections should be scrutinized for non-essential words and phrases. The words on your website are what guide your visitors down the road to lead conversions and sales. Copywriting for a website means being direct and concise, and speaking to their desires and concerns, will produce a website that goes beyond describing your company to one that grows your business. Breezy Hill Marketing is a Vermont web design company specializing in inbound marketing strategy, graphic design, and building beautiful and mobile responsive websites for customers throughout the United States.